The most widely used of all of the evergreen varieties, Magnolia Little Gem can be used as a screening tree or a feature plant. Glossy foliage with a brown felty reverse and large white flowers make this an attractive and versatile landscaping tree. The foliage is oblong and around 20 cm (8 inches) in length. New foliage emerges in spring and older foliage is shed at this time. The flowers are large and waxy reaching to 20 cm in diameter (8 inches). White and with a good fragrance that are attractive however not long lasting. Height over time can reach 10 metres plus, with a spread of 4 metres plus. However this is a variety that is easy to prune and can be successful kept to around 3 metres if desired. The natural growth habit is to form an upright pyramidical tree. Foliage is dense and growth rate is slow to medium depending on soil and climate. As a hedging plant, try 2.5 metres to 4 metres depending on the density of the screen required. How do you care for your Magnolia ‘Little Gem’. When planting, the soil is best prepared by weeding well and adding good amounts of well rotted compost and aged manure. Dig over rate areas to 2 – 3 times the diameter of the root ball or container. This gives the root system room to grow from establishment onwards. Water in well with a liquid seaweed fertiliser and mulch around the plant well to maintain a cool root run and soil moisture. Growing in container or pots is also possible, choose a large pot and use a good quality potting soil. In containers you will need water more regularly and fertilise each year in spring. Although this is a plant that will grow well in full sun it is also suited to growing in light afternoon shade. As this is an evergreen plant, ‘Little Gem’ works well to contrast the bare stems of Hydrangeas, and other deciduous shrubs. You can under plant with a range of smaller shrubs and perennials. On the shaded side, Hosta, Trilliums and even Astilbe can work well. Hellebores back a tough ground cover to surround the plant and of course flowering bulbs also work well. Taller growing deciduous trees can also work well, try Cornus Norman Hadden, Copper Beech and others. Magnolia leaves turning brown – Sunburnt foliage. In summer gardeners sometimes find that the leaves on their magnolia will turn brown, this is caused by two factors. During very hot summers, magnolia leaves are subject to sunburn. This is especially true if they are located next to heat reflective surfaces such as metal fences, stone paving etc. The solution is to protect the plant with shade cloth . A barrier between a colour bond fence and your plants will help reduce the heat and shade cloth or a timber screen such as bamboo will do this. Depending on the soil, a lack of water in summer can also lead to foliage turning brown. Deep watering, mulch and again shade can all help. Products that are sprayed onto the foliage ‘anti-transpirants’ are also said to be effective. This occurs with all Magnolia grandiflora types such as ‘Little Gem’, Kay Parris and Teddy Bear as well as the deciduous types. 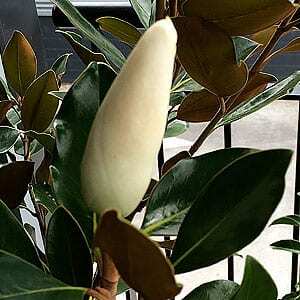 Younger magnolia plants with undeveloped root systems are often more susceptible to sunburn. Advanced container grown trees & shrubs. Large range of native plants & ornamentals ranging from 14cm to 45 litre. Specialists in indigenous plants and supply for Urban development. Supply & deliver all states. Offering a specialist variety of Australian native Ferns plus Dendrobium/Dockrillia & Sarcochilus species & hybrids in pots, loose, or mounted. Species Cymbidium sauve and maddidum. Advanced ornamental trees and garden designs and concept plans. Direct to your property combined with specialist knowledge and outstanding service.